Home Bylines The Complete Guide to Google Wave Now in Print! I’m thrilled to announce that the online book by Adam Pash and myself, The Complete Guide to Google Wave, is now in print! Order your copy here. The new edition is double the pagecount of the Preview PDF released last fall and it’s packed with screenshots and examples. In this expansion, Adam and I went out of our way, page after page, to illustrate the answer the most common question about Wave: “What is the point?” We added two new chapters, completely rewrote several existing chapters, and since the book is now available in print, added an index for easy reference. We scored a Foreword from one of my web heroes, Lars Rasmussen, who with his brother Jens created Google Maps and Google Wave. The coolest part of this DIY undertaking is that a portion of print book sales go to a great cause. San Diego-based charity Partnerships with Industry fulfills our print book orders. Instead of sending half the cost of the print book in an existing online print-on-demand service, your book dollars create a job for adults with developmental disabilities in my community. 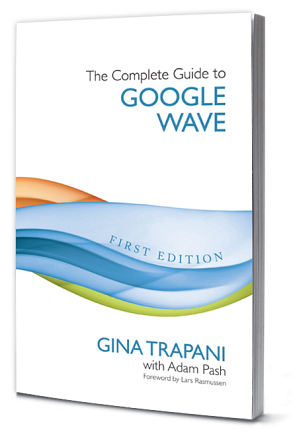 The new edition of The Complete Guide to Google Wave is available as both a PDF ($9) and a print book ($25) and on the web site (free). If you’ve already purchased the Preview PDF, to thank you for your early support, we’re upgrading you to the First Edition PDF for free. Keep an eye on your email inbox for that. If you haven’t already bought a copy, order one here. Thanks for checking it out, and I hope you’ll let us know what you think.